You know we like statistics so here are our latest findinds in terms of data on Black Friday, Cyber Monday and the holiday shopping season in general. We hope you’ll find those useful and…your welcome! 1) 31.7% of shoppers said they will watch retailers’ holiday commercials to discover holiday sales, 17.3% will monitor the retailer’s Facebook pages (National Retail Federation). 5) The ‘’in-store mode’’ feature of Walmart’s mobile app used by approximately 60% of those using the app, in less than 2 weeks after its launch (cnet.com, November 2012). 6) 12% of men say they always check prices on their mobile phones when in store while only 5% of women acknowledge doing so (Kellogg Shopper Index 2011). 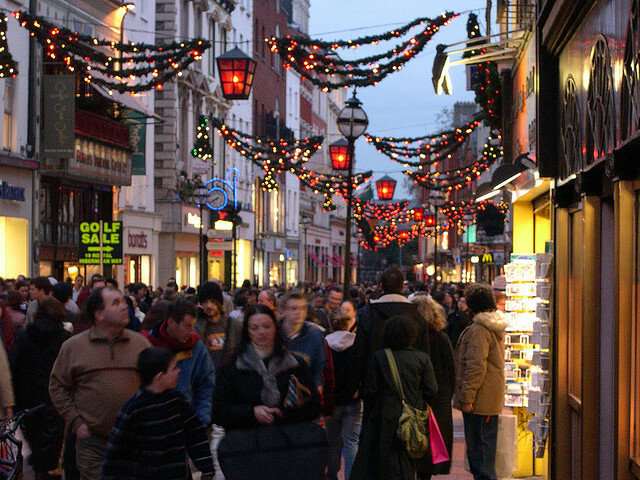 8) The National Retail Federation expects a 4.1 %increase in retail sales during the months of November and December, a higher one than the average holiday sales increase for the past 10 years (3.5 %). The total amount of sales projected for this holiday season is $586.1 billion. 9) Optimism is on the rise. 37% of Deloitte’s survey respondents feel that ‘’we are still in recession’’ in 2012 vs. 50% last year (Deloitte’s 2012 Annual Holiday Survey). 10) Nonetheless, the expected holiday budget has decreased by 6.1% from 2011 (Deloitte 2012). 11) Clothing ranks first on the list of gifts people plan to offer and 3rd when it comes to the gifts they want to receive (Deloitte 2012). 12) Consumers still like shopping at stores, an attitude mostly shared by those planning to buy premium or luxury items (Kellogg Shopper Index 2011). 14) Between Black Friday and Cyber Monday, display ads have a 32.6% higher engagement rate than the average. (Rhythm New Media, 2012). 15) 28% of the consumers had plans to shop on Black Friday and 26% of them envisaged to do the same on Cyber Monday (Deloitte, 2012). 16) 48% of Deloitte’s 2012 survey respondents admitted that social media will be part of their holiday shopping process. 17) 66% of social media users that made a purchase on Black Friday/ Cyber Monday 2011 did so as a result of interacting with friends and family on social media (Rhythm New Media, US). 18) The number of shoppers visiting stores over the Thanksgiving weekend hit a new record- 247 million, 9.4% more people than last year (Time Magazine 2012). 19) Retailers report robust post- Thanksgiving sales with consumers having spent 13% more than in 2011, the equivalent of $59.1 billion, according to the latest data disclosed on Friday (International Council of Shopping Centers). ‘’It’s not about offline versus online. It’s about taking advantage of all the channels, whether it’s stores, Internet, mobile or social media.’’ (Eric Anderson, Professor of Marketing at Kellogg School of Management). “The danger for stores is, of course, that they end up as showrooms for Web competitors like Amazon, but it doesn’t have to turn out that way.” he says. “As in any arms race, victory goes to those who best adapt to the new game.” (Richard Wilson, Kellogg Shopper Index 2011). Download our white paper to learn how in-store digital media can help you promote your deals, enhance your products’ presentation, influence customers and increase sales. 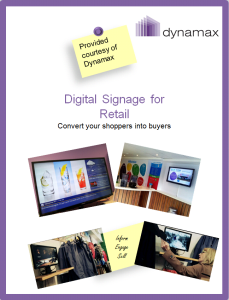 This entry was posted in Digital Signage, Marketing and Advertising and tagged digital signage, retail by Dynamax. Bookmark the permalink.